As mid season approaches, the standings appear to be tightening up somewhat. The Railroaders benefited a half game in the rankings from a record breaking defeat of the Pirates at the hands of the Bobcats, 20-7, Wow! So there's nothing superhuman about the Bucs and they have loss 4 of their last 6 games. But mind you, they are still a good team, no doubt. The tide could be changing though as the lower half teams are starting to play some better ball. That means we are going to have to push the engine even harder to take the season. The last place Browns have improved of late, winning 4 of their last 7. For the most part, they are keeping the games close, and I think they are the wild card in the league. They've had their woes, but make no mistake about it, they're getting tougher every game they play. Let's not take them lightly on Wednesday. The Oilers have taken 4 wins out of their last 6, including 2 of 3 over the Pirates. They are in 3rd place at this posting and only 2 games behind the Railroaders. They have played the fewest games in the league thus far, several PPD games to make up, but they are playing solid baseball and will be a force to reckon with. The Bobcats are only a half game behind the Oilers. They, too, are playing improved ball. As with the Oilers, the Cats have taken 4 of their last 6 games and beat the Pirates 2 or 3. They are done with Bucs yet either, Tradewater must face the Bobcats 4 more games in a row starting tonight. 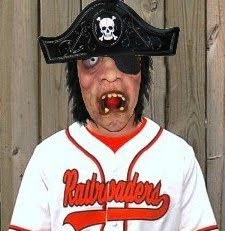 As for the Railroaders, we're in good position to make a move. The players have will have had 8 days rest out of the last 12 days before Wednesday's doubleheader with the Browns. Let's make sure there's no rust on board the engine and everything is greased for action. In the last 12 days, we are 3 or 6 games played, and we need to improve on that. Time to get down to work and win, Baby, win!